eScan, one of the leading Anti-Virus and Content Security Solutions providers has launched advanced MailScan 6.9 for Mail Servers. The latest version of MicroWorld's MailScan is an Anti-Virus, Anti-Spam and security solution exclusively designed for the mail servers that acts as a powerful gateway between the mail server and internet to provide real-time security to all email communications. The new MailScan scans all the emails before they are delivered to the mailboxes and /or sent out via the mail server. In this manner, it works as a solution for total security at the mail gateway that controls internal and external mail traffic of an organization's mail system. On the launch of MailScan's latest version, Mr. Govind Rammurthy, MD & CEO at eScan stated, "It is very important for all the corporate and enterprises to secure their mail servers. Email communications which most of the time carry confidential information have to be seen that they securely reach their destinations and at the same time the mails that are entering the organization also have to be checked against viruses, spam, etc. to secure the network. MailScan 6.9 does that and more at the mails server gateway." operations can be managed from a central location using the web administration tool enabling remote administration of the application. Integrated Security Policy Enforcement - allows creating policy-based rule sets on a universal or companying specific basis. Advanced Anti-Spam and Anti-Phishing - effectively stops spamming and phishing using a combination of technologies like Non Intrusive Learning Patterns (NILP), Greylisting, Real-time Black List (RBL), SURBL, General Header Tests, MX/A DNS Record Verification, Reverse DNS, X-Spam Rules Check and many more. Real-Time Virus Scanning at the Mail Gateway - scans all the emails in real-time for viruses, worms, Trojans, adware and hidden malicious content using powerful, heuristic driven dual anti-virus engines. Thus, online threats are averted before they enter the network via emails. Blocking Image Spam - filters out image spam using powerful in-built technologies. Real-Time Content Scanning - Effectively scans all incoming and outgoing messages in real-time for offensive words and adult content, with the help of security policies. Greylisting - Mails from unknown senders are temporarily rejected, as most spamming servers do not try to send the same mails again if rejected for the first time. In case, the mail is legitimate, the originating server re-attempts to send the mail, which is then accepted. LDAP and POP3 Authentication - MailScan is powered with LDAP and POP3 Authenticated Web Administration. This authentication is required to restrict unauthorized access to mails. Non Intrusive Learning Pattern (NILP) - is an advanced spam filtering method with the intelligence to analyze and classify each mail as spam or ham, according to the user's behavioral patterns. Auto-generated Spam Whitelist - When a local user sends a mail to an email address, the system automatically adds that ID to the spam whitelist. Attachment Filtering - helps block attachments having file extensions such as EXE, COM, CHM or BAT from being sent or received. Clustering - facilitates load balancing by distributing mails to multiple computers for scanning. Relay Control - prohibits spammers from using organization's individual IP addresses to send spam. Comprehensive Attachment and Email Archiving - facilitates customizable options to archive emails and attachments flowing in and out of the system. This feature also helps in comprehensive content auditing. Customized Disclaimers - is an easy-to-use option to add customized disclaimers to all external and internal emails. Virus Outbreak Alerts - A virus outbreak alert is sent to the administrator providing a detailed report of virus emails received within a defined span of time. eScan Remote Support - works with the help of remote desktop connection which enables MailScan support technicians to access computers with problems from a remote location and troubleshoot them directly. This helps in providing secure, faster and better support worldwide and also increases efficiency. Extensive Reports - Provides advanced analytical reports in graphical and non-graphical formats. Automated Hourly Updates - The anti-virus and anti-spam databases are automatically updated every hour for instant protection from emerging threats. 24x7 FREE Online Technical Support - Free telephonic and online technical support via email, chats and forums is provided by our experts round-the-clock. 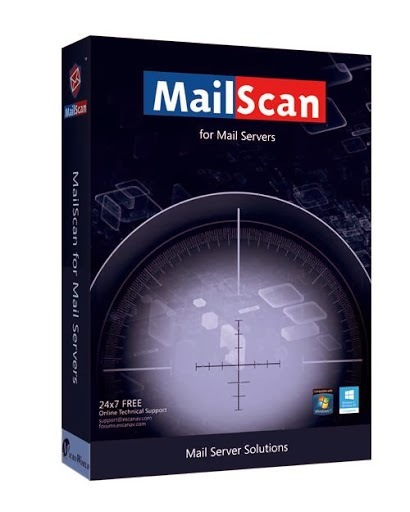 MailScan 6.9 is compatible with operating systems such as Microsoft® Windows® 2012/ SBS 2011 / 2008 R2 / 2008 / 2003 R2/ 2003 /8.1 / 8 / 7 / Vista / XP SP 2 / 2000 Service Pack 4 and Rollup pack 1 (For 32- Bit and 64-Bit Editions Only). eScan, one of the leading Anti-Virus & Content Security solutions for Desktops & Servers is developed and marketed by MicroWorld. It is powered by innovative and futuristic technologies, such as MWL Technology, DIRC Technology, NILP Technology, and sophisticated Anti-Virus Heuristic Algorithms that not only provides protection from current threats, but also provides proactive protection against evolving threats. eScan provides 24x7 free remote support facility, integrated in the software to help customers to get their malware related issues resolved in the fastest possible time-frame. It has achieved several certifications and awards from some of the most prestigious testing bodies, notable among them being Virus Bulletin, AV-Comparatives, ICSA, and PCSL labs. Combining the power of various technologies, eScan provides Multi-level Real-time Protection to Computers and Networks. For more information, visit www.escanav.com.